for the Lord you God is with you wherever you go. Go in this your strength...Have I not sent you? I had to give Ivy a haircut. He went from being beautiful, wrapped in a wreath of healthy ivy leaves that completely hid his pot, to looking like Alfalfa, sitting in a pot too big for him. His poor health and haircut were the consequences of my negligence. Plants need water to live, and I kept putting off watering. I'd tip my water glass into him every now and then--whenever I happened to see he was wilting, but it was never enough. Yesterday I noticed that he was almost completely dried up. I'd waited too long to water him. Sin, and its consequences, work the same way. My sin affects others. There have been many times that I've messed up, and my family paid. It wasn't just me getting the haircut. It wasn't just me that was left looking like Alfalfa. The fact that they were so affected hurt me more than my own personal consequences—those I could accept and deal with—but knowing they were suffering because of me, was like constantly cracking open a scab that was trying to heal. Don't put off doing what you know needs to be done. It may take awhile, but the evidence of neglect will eventually become visible, and when it does it's ugly! That's when the shears come out and the dead gets cut off. If it doesn't get cut off, it just causes a much bigger mess as time progresses, on top of being ugly. Don't delay! Get rid of the dead, gather the living 'round about you, and move on. Sure, you may look like Alfalfa, but it will only be for a time. Water yourself with the Living Water and new growth appear, hopefully thicker and healthier than before. Welcome to Fiction Friday! This week Joanne is hosting at An Open Book--that's where you'll find Mr. Linky. See ya there! I am a croaker. Ok, so maybe I don't quite croak, but I am a charter member of the Joyful Chorus, as we call ourselves. To be one of us you cannot sing in tune, but you have to love--and I do mean love--singing. We're the people you see hanging around the choir, but never in the choir. Thankfully, our church is large enough to have a wonderful choir and still have lots of people in the congregation to camouflage our bad voices. I am so glad for that because it means that I get to really sing. One of the few times I feel free to sing loud, so I do. “Kelly, why aren't you up there singing with them?” one of our senior men asked one night as choir practice ended. “Yes, as in 'Make a joyful noise unto the Lord',” * I said, winking at him. Soprano? No way! When I get to heaven I'm going to have one of those velvety, rich alto voices and I'm really gonna belt it out then. Man, I can't wait! But what I said to that dear man was, “Oh no, when I get to heaven I'm going to sing alto.” I was very demure and I smiled prettily for him—maybe that's why he thought I sing soprano, because he only sees the polished outside me and not my wild, sassy side. Later that evening, during the service, my heart filled as we sang one worship song after another and I felt like I'd been set free after a week of solitary confinement. I'd kept up with my daily Bible reading and time with God, and it was wonderful, but this--this was better than a hot fudge sundae could ever hope to be. My soul craved this time of worshiping with my brothers and sisters, being able to sing out to God, and to actually sound good while singing. Without interrupting the flow, the musicians moved into “How Great Is Our God”** and I could feel it moving into me, lifting me higher and threatening to burst out of me. Lord, I can't wait to sing praises to you in heaven. If worship is this good here, what's it gonna be like singing with that great crowd of believers? And the angels, Lord—I'm gonna get to sing with the angels. I can't imagine how good it's gonna be. Thank You, Father... My heart overflowed. As the music built one voice soared above the congregation—Elijah's. Elijah is happiest when he's singing and I didn't have to turn around and look to know that he, too, was caught up in worship--I could tell by the joy flowing through his voice. His clear tenor took the high road as we sang the melody. I'm not one to usually get goose-bumps in church, but I had them at that moment. The truth of what we were singing flooded me, lifting me higher than I'd ever been. Father, God, I prayed at the end of the song, thank You for allowing me to be here, worshiping with my brothers and sisters. Heaven will be incredible. Out of the corner of my eye I saw the older man I'd talked to at the end of choir practice. And Lord, thank You for blessing Elijah with the voice You have. What he added to that song was beautiful. Do you think I could sing tenor like Elijah sometimes? Until then, Lord, I'll be in the Joyful Chorus, enjoying every chance I get to sing, even if it's only joyful sounding. This story is now a tribute to Gary Menees, who died late this spring, many months after I wrote this. During Christmas choir practice one night, he asked me this question and thought I would sing soprano. Unfortunately, I didn't think to tell him that I was part of the Joyful Chorus--he would've gotten a kick out of it. Also, for this story, I made him into a much older man, but in reality he wasn't. He might have been 64 or 65. We miss him greatly! Also since writing this, Elijah has married and moved, so I only get to sing tenor when Nathan or Mark are belting it out, which they do occasionally. But that's okay because when we get to heaven, I'll get my new singing voice and I can't wait to use it! Gary and I just might sing a duet sometime. 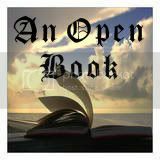 Don't forget to join us at An Open Book links to some great fiction! PS--Next week Betsy is hosting over at Just Another Clay Pot. Have you sat down recently and counted the number of hats you're juggling? When I did, I decided I needed a hat rack to help me keep them organized and in good shape. I'm responsible for the office and financial book work for our remodeling business. I teach in our children's ministry on Wednesday nights, and although I love the kids dearly, many times I feel like I'm wrangling. Wrangling what? Rowdy kids, of course! 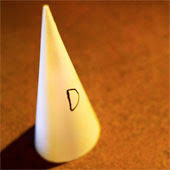 If you knew how many times I've felt like I was wearing this dunce hat, you'd laugh yourself silly! 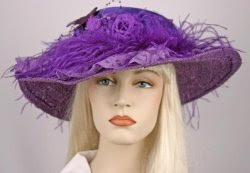 When I sit down to write, I have to consciously remove it and put on my daring, but always fun to wear, thinking cap. Oh, the places I go while wearing this victorian touring hat! I just wish I had the guts to buy and wear one some time! Homeschooling means that there are time I have to wear a hat to maintain law and order, but thankfully I can switch it out for something more suited to me, a comfy, all purpose straw hat. I'm a wife. My husband, Jim, and I have been married for 19 years. We've been through ups and downs and many struggles, but I'm so glad he's my husband. I'd marry him all over again! I'm a child of God, a daughter of the King of Kings, and that's the greatest, and most important hat I wear! Not only am I an heir with Christ, but I'm gathering crowns to lay at His feet when I finally get to heaven. Just think how beautiful that hat rack will be! In my broom closet we have two brooms, a shop broom with a wide head and soft bristles, and a smaller, normal house broom. The shop broom does a great job on 85% of our tile floor, but for the other 15% we need to use the smaller broom. A lot of dirt gets tracked into our home and I often have one of the kids grab the big broom and do a quick sweep so we aren't crunching with every step and tracking it onto the carpet. But those quick sweeps with the big broom don't eliminate the need for a thorough sweep, complete with using the smaller broom along the edges and under the kitchen cabinets. When life gets real busy, I settle for quick sweeping jobs, but just as soon as we can, we get out the smaller broom. My spiritual life is similar. A lot of dirt is tracked into my life just simply by being human and living. Many times I reach for the equivalent of my big broom--I'll read a shorter Bible passage and pray as I go, but I leave the more detailed Bible study and in depth prayer for another time. My goal for a quick sweep is to keep the grungies and crunchies away until we can do a more thorough sweep, and the same is true when I do a quick sweep spiritually. It's to keep the grungies and crunchies away. But it doesn't eliminate my need for that in-depth time of Bible study. Time spent with my Bible and a pen--studying, not just reading. Don't just settle for a quick buzz through the Scriptures. Make time—yes, make the time by rearranging things in your life if you have to, to study and linger in, and on, God's Word. It will sweep the grungies and crunchies out of the corners and from around the edges of your life, leaving you clean, refreshed, and full of light. So, today is the start of the 100 day countdown to the end of the year. I, personally, want to finish this year strong—much stronger than I started it. That means that I have some work to do. The finish line is in sight and I'm ready to pour on the power and get things wrapped up. How about you? Do you have loose ends that are flapping in the breeze? Do you want to finish strong and tie up those loose ends? If you do, jump in and join me in this 100 day challenge. We can encourage each other and cheer each other on. Well, summer is officially coming to an end for me. The hummingbirds are migrating south and we're hosting a batch of them as they stop and tank up before continuing their journey. Every year at this time we have a feeding frenzy and it's amazing to watch. I was just standing out there, listening to the whirring of their wings as they zoomed past me and fought over the feeder. 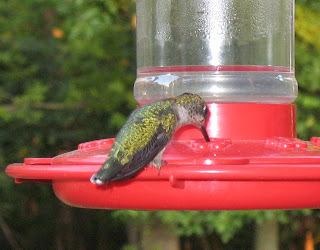 We had 6-8 hummers at one time perched and eating—after they had worked out their differences. LoL. 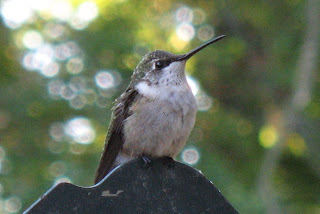 I love seeing the hummers. They're some of God's coolest creations, at least in my book, and I hate seeing them leave. All summer I enjoy watching them, and I miss them all winter and wait for them all spring, cheering when I spot the first ones. 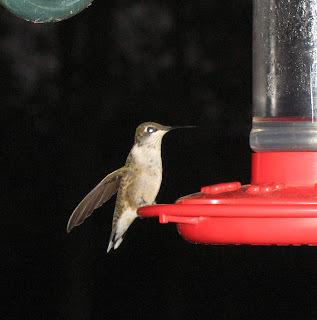 The hummers know when to move on, and they do. What about me? Am I tuned in to God so I can feel the change and know when to move on? I want to be. I don't want to stubbornly stay and end up shivering and shaking through a cold night I was never meant to be in. Lord, help me know when to spread my wings and fly, and lead me in the path You have for me. Please, give me courage and help me to follow Your prompting and trust in You. Thank You for being my refuge. I love You, Lord...in Your Son's name, amen. Thanks so much for joining us for Fiction Friday! If you're joining us in posting, add your name and url to Mr. Linky and enjoy the other fiction. If you're reading, be sure to follow the links--there's some great stories this week! Editorial Note: Please understand that this is not about our poor, silly old truck but rather about what I learned from the tree. My heart is heavy for those who had their lives rearranged by Ike, and my prayers are with them. When Hurricane Ike blew through Illinois yesterday, he left his calling card. It was the last storm for one of our three ancient tress in the fence row, and when it went down it had a slightly softer landing than we would've liked. The topmost branches took out the windshield and hood of old Sugar Pile—that old truck that I drove through downtown Chicago. But God was so good! 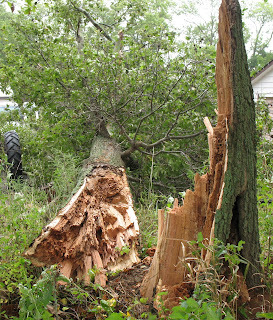 The tree landed between the shed and the barn, only left a couple minor dents and scrapes on Jim's work van, and did no damage to the tractor that we use far more often than ol' Sugar Pile. That root of bitterness will hollow out our insides just as surely as rot hollows an oak. When we're hollowed by bitterness, we'll eventually snap in a storm, too, leaving all our bitterness and rottenness exposed for any and all to see. It's not a pretty sight. What happens to the trees once they're down? They're cut up and burned. Usually the ones that have snapped are not usable for anything beyond firewood, and even then, some of it doesn't even burn well. That's not what I want for my life. I want my life to gather crowns so I have something to lay at the feet of Jesus. That means I need to dig out any root of bitterness before it eats away my insides, leaving me hollow and weak. ...in post counts, that is. I went to post today's blog and just happened to need to sign in to Blogger, which took me to my dashboard and my eye just happened to catch '99 posts' as I clicked the new post button. This is unusually because this is only the second time I've noticed how many posts I've made! And the last time was months ago! So, I decided I'd save today's post for tomorrow and do a fun 100th post for today to celebrate! It's also pretty cool that I received a blog award this award. It's the 'I Love Your Blog Award' and I received it from Julie, the Surrendered Scribe and Joanne of An Open Book. Thank you so much ladies! You're both wonderful! I'm passing this award on to The Herd. She's just recently moved to St. Petersburg, Russia, and I've loved following her along her journey. Thanks again, Julie and Joanne! You've made my day even more special! Happy 100th post, everbody! 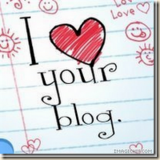 You've made blogging a truly wonderful thing for me! Huggles all around! Today's Fiction Friday is being hosted by Julie, The Surrendered Scribe. Join us there for links to more great fiction. The cage rocked gently as it rose higher and higher, and Cindy's knuckles grew whiter and whiter. 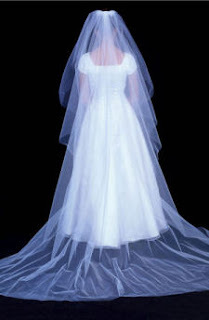 When they were at the highest point her fingernails were chalk white and she was quietly gasping for breath. Below her she could see people walking around with their cotton candy, but that was all she had time to see before her stomach started rolling and twisting. Panic was beginning to set in. “Gramp and I have always loved ferris wheels, but when he saw his idea wouldn't work he took me to the lookout point. It was the highest point we could get to.” Gram smiled nostalgically but Cindy hardly noticed, as she was too relieved to be on the way down. The lower they went the more color seeped back into her knuckles and once they were near the bottom she pulled each finger from its stranglehold on the seat. She shook them out and rested them in her lap, but that only lasted until they began going up again. When they were half way to the top her hands were clamped back on the seat. Her mother laughed. “Did you forget you're afraid of heights? Oh, not little heights, only the big ones, like this.” She waved her fingers around her head. “Looking far in the distance helps. Heather, do you think we can see Kincaid's barn from up here?” Heather frantically looked for it and as she did she seemed to relax a little, even though they were just past the highest point. Cindy, who sat facing them, had her eyes fixed on the parking lot she could see in the distance. She noted the kind of trees that surrounded it and the trolley winding through the rows of cars. The farther out she looked, the less her heart raced. “You know, riding a ferris wheel is a lot like trusting God.” Gram said as they slowly went down. “Oh look, there's Millie Hunter, from church. Wave, girls, maybe she'll see us.” They managed small waves and Gram beamed when Millie waved back. “How is riding a ferris wheel like trusting God, Mom?” Cindy's heart was speeding up again and she was thankful for the distraction. “Yeah, I see it! It's even big from up here, Mom. Next to that big barn, their house sure is small!” In her excitement Heather had forgotten to be scared as they rounded the top. “There. You see? When you get your eyes off where you are, and look around, you can see so much. Fear blinds you to the really wonderful things in life.” Gram reached over and gave Heather a squeeze. Just two weeks ago we were at the State Fair, and it reminded me of this story that I wrote shortly after going on a ferris wheel at California Adventure Land. I was the one with clamped fingers. I have to admit that I'm curious to know if I'll be as scared the next time I go on one--I hope not. My laptop sits right beside my dining room windows, making it so I can do all that I need to do in a day: keep track of, and be available to kids, home school, and my computer work. I love my windows, they're my peep holes to the world, but earlier this summer a small stone was thrown from the mower. It was just a tiny stone, but it's had a lasting impression on my poor window. Cardboard now covers a third of the bottom pane of glass, effectively cutting off my view as I sit and work. If I lean a foot to the right I can see the hummingbird feeder through another side of the window, but the cardboard prevents me from watching out of the corner of my eye. 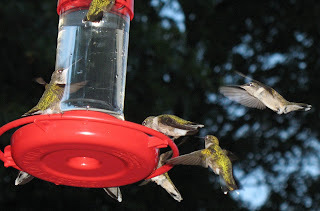 This time of the year it's a feeding frenzy as the hummers stop and refuel on their migration South. They are incredible to watch and I'm missing out on many of their antics because of that cardboard. There are things in my life that are doing the same thing as the cardboard on my window--they're blocking my view of all that God has for me to see. It's hard to do things that you don't even know need doing, so not only am I not seeing things, I'm also not doing the things God wants me to do. What is hindering, or even preventing us from obeying God? We need to remove the obstruction and press on. There may be things in our lives, possibly even good things, that are blocking the blessings of God's best. We may be serving in the nursery, which is a very good and needed service, but maybe God has a Sunday School that we should be teaching instead. Maybe He's given us talents and gifts that we could be using for Him and we don't see them because we're busy doing other things. We need to search out the specific things He wants us to do, and then clear the path to doing them. The cardboard patch on my window is only a temporary patch, but it's been there for weeks now. What temporary things in my life have I allowed to linger and that are now causing problems for me? Sometimes a temporary, short term commitment we made stretches out and takes up residence in our life. We need to stop and examine things and search out whether those have outlived their purpose or if they're things that God wants us doing. We need to remove the things blocking and hindering us and pursue those things God has laid out for us. Sometimes that means making repairs, other times it's getting rid of, and still other times it's getting up and moving. Whatever it is, it will be more than worthwhile as we fully see what God wants us to see. Our blessings and joy will multiply as we fix our eyes on Christ and do what He has for us to do. 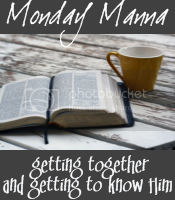 Join us at Exemplified for more of Monday Manna, a monthly meme mulling over a Scripture. You're sure to be blessed! I don't know about you, but I love sitting down to a table so full of food that I don't have to worry about there being enough to go around. I like knowing that there's enough for everyone to tank up on and still have leftovers. Now, in my house, that means a lot of food! An abundant amount. And on those special days when I'm putting out the full spread (Thanksgiving, Christmas) I cook enough to feed us for several meals. I go for the 'more than abundant' quantity. Our God, the One True God, is a more than abundant God, too. WoWzers! What a verse! This is one that I can hear Pastor Mike reading and saying, 'Somebody oughta stand up and shout!' because that's exactly what I felt like doing when I reread it. God's grace was more than abundant! How cool is that?! The grace of God isn't just enough to scrape and squeeze us through Heaven's gates, it's more than abundant. He didn't save us just a little, He overwhelming saved us by His abundant grace. And how much faith and love are found in Christ Jesus? All faith and all love. This is one of those verses that, after I stand up and shout, I fall on my face in praise and awe of our great Redeemer. Karen looked out the window and chuckled to herself. Ever since Rachel had read a book about an artist that was all she had talked about. Today she had taken it a step farther. She was out in the yard with a tablet of paper and her coloring pencils, intently working on drawing something. “Relax, Mom, I’m gonna get that ‘How to Draw’ book you gave me for my birthday the year I decided I was gonna be a great artist and become a cartoonist.” Karen could hear the laughter in his voice as he went down the hall to his room, soda in hand. Rachel laughed, “Oh the drawing went real well, but I’ve decided to let art be one of my hidden talents. Very well hidden!” She was snickering as she pulled out the mixing bowl. Karen was really confused now. “Soooo, what happened that you decided not to be an artist?” Her daughter had never responded like this to disappointment before, and she didn’t act like Ron had hurt her feelings. What on earth was going on? Both laughed, “In that case, I’ll join your taste tester club, and leave the experimenting to you!” Karen hugged Rachel and made a mental note to give Ron a big one, too, as soon as she saw him that afternoon. Maybe cooking could become one her hidden talents now. This is another one of my early stories. LoL, one of my very early stories--and like the mom in here, I'm not one that enjoys (or is good at) cooking! My daughter is much better than I am--at least I can claim teaching her the basics...but not much else. LoL. Since this week has NOT gone according to plan (but really, when do they?!) I'm gonna kick back and have some fun...because I need some! My dear friend Dee at My Heart's Dee-Light tagged me for 8 Random things, so here they are, in random order. 1.I'm addicted to smiley faces. 2.I hate noise, so I have three cats (well, four if you count the stray that we feed but don't claim), one touched-in-the-head dog, and five kids—all of whom love loud music, just like their dear dad. One of the best gifts Jim has ever given me was an mp3 player. I can put in my ear buds turn on Mozart and tune out the lunacy around me. 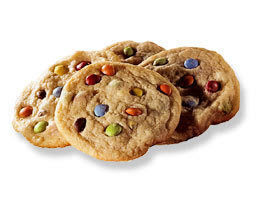 4.I always have a secret junk food stash near at hand ...and it needs constant replenishing. 6.I keep old shoe laces because we once tied together a Bronco's universal joint with my shoe lace...and made it up the mountain and safely home. 8.I'm actually toying with the idea of sky diving. Operative words: toying with the idea.